Photo of Glenda Denniston by Cathie Bruner. Since 1997, community volunteers, students, and staff have been working to enhance the plant and animal diversity of Frautschi Point. 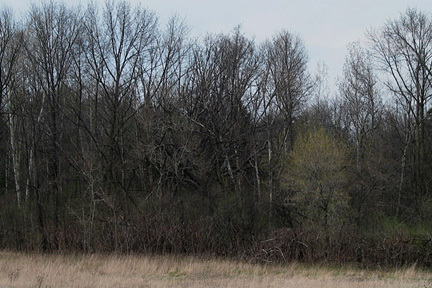 Used as farmland and a hunting preserve for many decades before being acquired by the university in 1989, the abandoned fields quickly became reforested with a thick cover of native trees and an even denser non-native understory of honeysuckle and buckthorn, with dense stands of garlic mustard on the forest floor. These invasive plants can have devastating effects on native species whose habitats they destroy, and to keep that from happening, this area has become the focus of a sustained effort to remove invasives to restore native biodiversity. 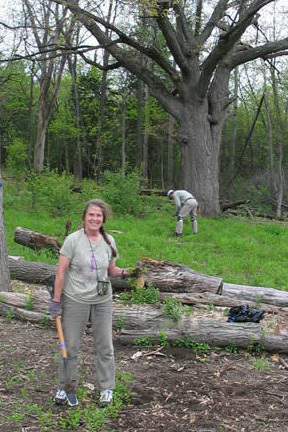 Volunteer Steward Glenda Denniston (pictured) has led students and other volunteers to create a delightful path through this part of Frautschi Point to connect two large old oaks that once stood as lone trees in these fields. By the 1980s, invading shrubs and trees were beginning to shade out these grand old oaks, which would eventually have been shaded out and killed if no action had been taken to save them. Cutting buckthorn and honeysuckle back farther and farther from the path, removing garlic mustard every year as its long-surviving seeds keep sprouting in the soil, nurturing and replanting native woodland and savanna species in their stead, volunteers have uncovered a rich topography of habitats. They have sought to identify young bur and white oaks and other native plants in need of special care, while at the same time, retaining non-invasive evergreens which, though not native to this area, nonetheless provide nesting sites for birds and diverse views for human visitors. 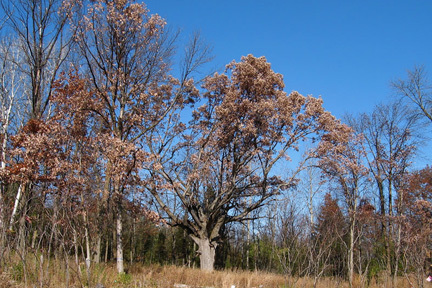 Below is a before-and-after pair of images during the restoration project.The first image was taken from the edge of the field April 15, 2004–can you find the oak at all? The second image was taken from about the same spot on November 5, 2006. It’s a different season, obviously, but you can see the result of the restoration work done here. If you’d like to get involved with this kind of restoration stewardship yourself, be sure to visit the Volunteer page. Second Oak before clearing. Photo by Glenda Denniston. Second Oak after clearing. Photo by Glenda Denniston.